Looking to boost your food or beverage brand? 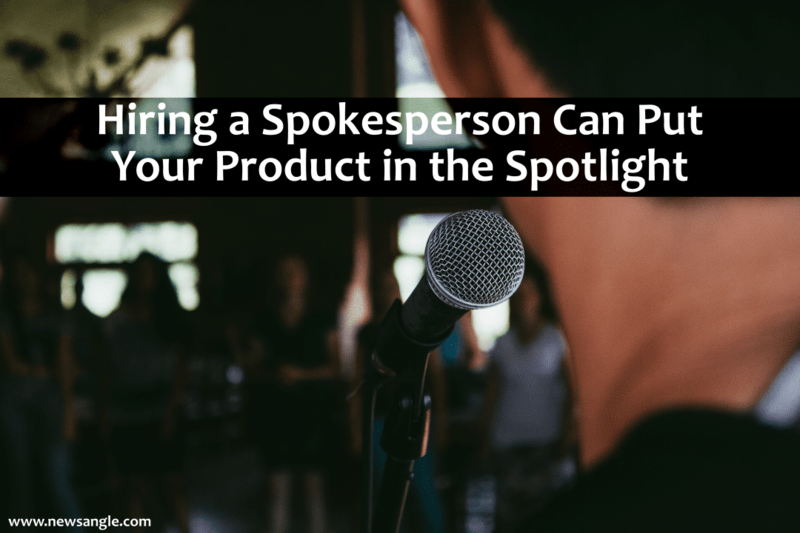 Consider a spokesperson to help put your product in the spotlight. Right off the bat, you can see the advantages of employing a food expert or celebrity to bring attention to your campaign. Video is being consumed at ever-increasing rates on channels like YouTube, Facebook and Instagram. Plus, the media is often more inclined to interview those with “celebrity status.” A spokesperson will help cut through the media clutter and deliver your message in a clear, concise and convincing way. But choosing the RIGHT spokesperson involves a series of careful considerations. Your obvious first task will be to choose someone to represent your brand in a credible and articulate manner. One way to do this is to review the food, business, and lifestyle pages of newspapers, industry trades, blogs, and key social media channels such as Instagram. Perhaps some knowledgeable “foodie,” celebrity, or social media influencer springs to mind. Each personality will bring different benefits and skill sets. What to consider when creating your list of possible spokesperson? Does the person provide a credible image for our product or company? For example, you wouldn’t want to select a well-known food expert who is lactose intolerant to promote a dairy. Is the celebrity’s involvement with our product believable? It would be odd to have a famous hostess who has entertained presidents and royalty on media tours for a chain of casual dining restaurants. Would this person use our product as a matter of personal preference? An Italian cookbook author might make an ideal candidate for a producer of gourmet spaghetti sauces. Does the spokesperson or celebrity have any conflicts of interests with our product? A food expert employed by an ice cream maker would not be a candidate for a dairy that has ice cream in its product line. Can the person cut the mustard? You’ll be demanding a lot from this person, especially if video production and television appearances will be part of your campaign. Cooking and talking at the same time is not an easy skill to acquire. Remember, the spokesperson’s task is not just talking about the product, but making lively conversation. Sometimes that involves an uninterested host whose idea of cooking might be calling for reservations. The ability to multi-task is key, as the person will need to face a camera with confidence, know your product inside and out, and be authentic, likeable and well-groomed. He or she will have to know when to look at the camera, when to look at the host, and when to look at the food, as well as go through the motions of preparing a recipe for the viewers at home and online. Yep, you guessed it. Your spokesperson will need to be a performer. A strong spokesperson can help elevate your YouTube channel and social media networks, and create raving product fans. But he or she will need to be media-savvy as well. While media opportunities such as morning show cooking segments may be less available than they were a decade ago, they do still exist. A consumer product spokesperson needs to have basic media interviewing skills such as “bridging,” which is the technique of briefly answering a tough or negative question, then transitioning back to one of the key message points for the publicity campaign. Bridging returns the conversation to a positive note. Your spokesperson will need to be comfortable making personal appearances, such as giving a cooking demonstration to a crowd at an event, or talking to an audience about the benefits of your product. Keep in mind that some social media influencers in your industry who are powerful online might be uncomfortable when it comes to speaking in front of an audience. A recent article on the American Express Small Business Forum, “6 Considerations When Hiring A Celebrity Spokesperson,” gives additional tips about what to consider when engaging a spokesperson to take your brand’s message to a target audience. After you’ve identified your spokesperson, it’s time to sign on the dotted line. Negotiate a contract, or at least a letter of agreement that details exactly what is required of both you and the celebrity. The agreement should make clear exactly what you will provide in the way of support and reimbursements. It should cover transportation, hotel accommodations, limo services, rental car or mileage, per diem charges if any, hours or days of appearances, and if the spokesperson may take along an assistant—and who pays for the extra person. If your spokesperson is also a major social media influencer in your industry, your agreement should need to include an influencer marketing element. Service agreements with influencers are always outlined in advance, such as how many tweets, videos, images or articles will be posted during the campaign, and which hashtags will be used to engage with their audiences. For example, if during the fall apple season you hire a spokesperson—who is also a social media influencer—to demonstrate on television and at county festivals about the best ways to use apples in baking and cooking, you would want your agreement to include how many times the spokesperson will post about apple recipes on social media and which hashtags will be used. On the flip side, if your spokesperson is uncomfortable with social media and you want a digital marketing element to your campaign, a decision will need to be made about who will handle posting images of the spokesperson in action. You will also need to consider who will respond to any comments or questions directed toward the spokesperson about the product. Most likely, you will be distributing a news release announcing the beginning of the fall apple season, and a quote from your spokesperson about different varieties of apples, which are best snacking and the distinctive taste. It’s also the time to decide which recipes your spokesperson will demonstrate on air and on video on demand channels such as YouTube and your website. Plan your social media posts on key networks, and which branded hashtags you’ll use during the campaign. If your spokesperson is also an influencer, the digital marketing part of the campaign will need to include how many images or posts will be published on the influencer’s social networks, along with what content will be used on your brand’s social networks. To stay within budget, schedule one day to photograph all upcoming Instagram posts and images for other social networks during the campaign. For Instagram, use a grid preview app, such as Preview, to plan your posts to keep your feed visually engaging. All your social media posts should be thought out in advance and scheduled to make sure all elements of the campaign are integrated. For videos, your spokesperson might need to change into different clothing to avoid the appearance that everything was shot in one day. Since most spokespersons have a day rate, it makes sense to try to make good use of their time each day with multiple media interviews or television appearances. Plan your spokesperson’s day wisely. For example, your spokesperson might demonstrate a recipe on a morning television show, post on social networks, and also make an appearance at an event to demonstrate a recipe and answer product questions. Remember the floor is littered with people who never tracked their marketing projects, and you’ll need to put into place a mechanism to measure the success of your campaign, such as an increase of offline sales or some type of online conversion target. Now that you’ve worked out all the details, you’re ready to put your campaign in motion. Call LEA for assistance. For more information on food and beverage PR, read our post on food safety crisis communications. Also check out our post on how to use influencer marketing successfully. "We’ve had a long-term relationship with Lee Esposito Associates, and the proven results are always successful. Whether the goal is to land media coverage for our firm, to get our clients in front of a newspaper’s editorial board, or to help increase brand recognition for a client’s community outreach program, his campaign strategy is always on the mark. "